My dad put it best: ‘It’s not about the destination, it’s about the journey,’ and boy, does he ever capture the spirit of RAGBRAI perfectly. The Register’s Annual Bike Ride Across Iowa is one of the more challenging things I’ll ever do, but it very quickly transformed into much more than a bike ride, filled with awe-inspiring tales and jaw-dropping sights. Where do I even start? There are mountains of adventures to digest, reflect on and truly admire from my four days on the road. Embarking on this physically tasking trip may have taught me more about the state of Iowa and adulthood in a single week than I have in my entire life, and I’m a born and bred Iowan. It made me crave more, just like they’d warned me. It really is an event you have to experience to truly understand, and for my first time, it was definitely everything I expected and then some. There’s a little bit of everything for everyone during the annual tour of Iowa. I made it my own, as they say. Before I dig in further, I must admit, the hills of RAGBRAI are no freaking joke, but neither are the stories and the adventures. Wow, were there moments to drink in and interesting folks to dissect. What stood out most was the openness of the riders, whether exaggerated, true or not, inspiring, or devastating – it paid to have a quiet ear and a willingness to ride along for the journey. I never expected to take a detour north of Kalona to drink in the vast history of the Amish community and German homesteaders, all while sharing a drink with fallen family members. Or how easily it is to capture someone’s attention by sharing second-hand Donald Kaul stories. Tuesday’s leg to Ames led me on a wonderful path to the beautiful underside of RAGBRAI, mingling with the off-route rebels and baggers. The ride isn’t so much a vacation as it is an experience. I rode only four of the seven days, but even Monday’s leg felt like it happened three weeks ago. When you tour six or seven small towns a day within the long, grueling highways of Iowa, each leg feels like one or two days each. The 71-mile July 23 ride from Denison to Jefferson was a 12-hour adventure that required physical determination, patience, and good-fortune (screw you, rain, four miles outside of Jefferson). It’s true what they say, once you get the first day out of the way, it becomes significantly easier. I still forgot sunscreen almost every day, I didn’t eat enough fruit and I didn’t talk to nearly enough people, but I was able to enjoy it more and sample the towns and people of the event. • Traveling through the vast landscapes of Iowa by two wheels was truly astounding. The views went miles once we crested the massive concrete humps of Crawford and Carroll County. A run near Wild Cat Den State Park outside of Montpelier was pretty captivating, under the canopy of daunting oak trees and down a steep hill, as was getting a tantalizing a glimpse of the Mississippi River shores Saturday afternoon, though we were still a good 15 miles from Davenport. The ultimate tease as the route sent us back west for a bit, into Blue Grass, which is home to one of the coolest drive-in theaters. They show two screens a night (working on a third) with a sit-down restaurant underneath the massive screens. I know I’ll be back in the near future. • One of the most humbling moments came from a woman by the name of Cindy Sleichter Ross, a descendant of German settlers, north of Kalona. She was raised on a 200-year old farm. Her grandparents brought up eight children – the first and last separated by 30 years. Ross, who rode all seven days, 428 miles of it, spoke of the seamless transition the Amish enjoyed in the area, even taking us to the most heart-warming grocery store in eastern Iowa. The lights, fans and cooler of Stringtown are all run off kerosene. The farm tractors and plows use steel wheels without tires, which create grooves on the back roads and can definitely be felt on a bike. Wow. The Amish community is much more than just a horse and buggy and simplistic living. We then continued our detour off route to a small cemetery among the rolling hills of Washington County. Ross shared more details of her heritage as we sat down with her late parents and brother Randy, overlooking the old family farm. It was as peaceful a moment you’ll ever find on RAGBRAI. This was a drastic heel turn from what I experienced just a few days prior on my second leg. • I followed the notorious “baggers” Tuesday afternoon and saw the much less commercialized side of RAGBRAI. Baggers carry all their materials, clothes, tents and necessities on their bikes, they are completely self-contained. No teams, no buses, no SAG wagons. They really aren’t as crazy as many think. The “rouges” who go off-route just want to avoid the crowds and take their time cherishing the open road – or trail as we were Tuesday. On my second day of RAGBRAI, we rode 25 miles in an eight hour span – the festival was waiting on us that day as we cruised the Raccoon River Valley Trail south through Perry and connected with the western portion of the High Trestle in Woodward into madrid. Baggers aren’t rebels though they do ride, often literally, on the dark side (at night), but the unnecessary ruckus is left at home. Yes, while some tend to get slightly inebriated on occasion, most are in it for the same as all riders are – for the experience. Jamaica was a boom-town Tuesday morning, hundreds of bikers stopped at the One Last Stop bar just off the trail, continuing a late night memorial party a few hours before. Perry was littered with bicycles and, holy moly, I bet the tiny town of Bouton and it’s quaint little bar, the Rusted Sprocket Tavern had never seen so many people before. The most shocking thing of all, the only way to reach Bouton was either by taking a heavy-trafficked Highway 141 or by four miles of gravel. The determination to find something new and unique was quite the eye-opener. Tuesday’s ride was a treat that not many casual observers know about, and I hope to experience again soon. It helped me grasp the notion that there isn’t a rush to completing RAGBRAI, the finish line will still be there a few hours later. 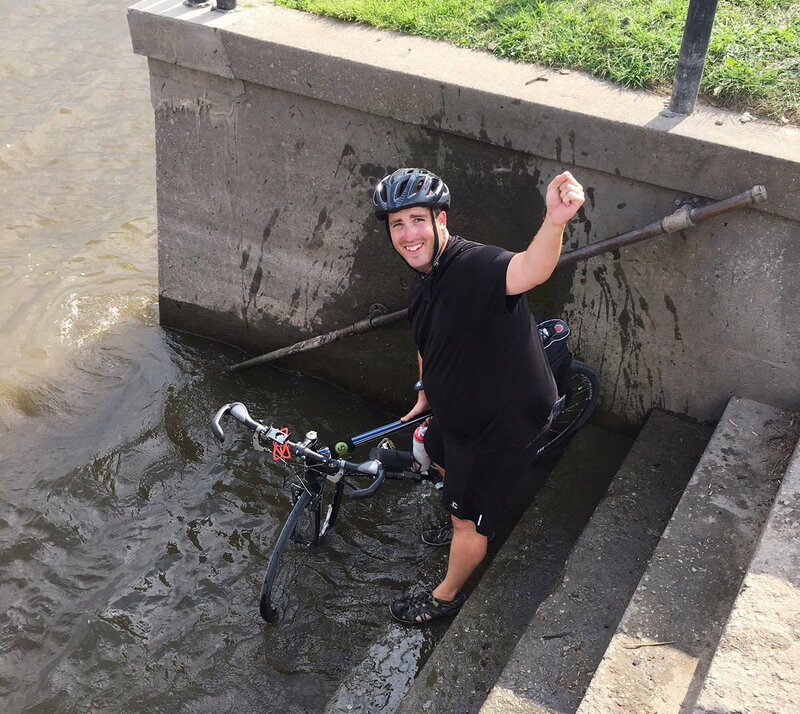 • Of course, some bikers are nutty as can be – there are a select few who essentially embark on two RAGBRAIs – riding out to the start and joining the thousands of riders on the official ride. And though we hear about the toxicity of journalism these days, it was nice to run into a handful of riders who still have a passion for the profession today – a journalism professor who spent years in Asia, and a Perry-native who gushed over Chuck Offenburger and his respect for the industry. There was a guy in booty shorts – and that’s all – riding bare foot into Davenport. He had to be at least 70 by the looks of it, and never has a shirt. His back was as worn and as tan as a leather couch. I saw wedding dresses, flannel shirts, mo-hawks, wigs, massive coolers, colorful lights and matching outfits – from helmet to toes. The people watching during RAGBRAI is at a completely different level, one that I’d say is even above the Iowa State Fair. • I learned a lot about my dad’s high school days and how loose the law was back then. Tales of wild gravel road parties and stolen outhouses, “scooping the loop.” My, have the times changed. • My favorite stop was definitely Kalona, for the Amish culture, the stories, the ice cream and fry pies, and of course, the beer. A neat little town tucked away among the rolling hills of eastern Iowa. Keota was a close second with their old school downtown and amusing amateur wrestling matches. The poor acting was hilariously over-the-top, complete with broken tables and metal chair slams. West Liberty’s local street tacos were particularly delicious while Cliff’s breakfast bowl (during our lunch break) in Manning were satisfying as well. Templeton brought out ‘bobbing for beers’ and a pit stop from one of the more charismatic and out-spoken hosts of the entire week. I waited until the final day, but I got one of RAGBRAI’s initiation foods. I also loved cooling off with ice cream and no guilt, snacking on whoopie pies and cherishing strawberries, bananas and protein bars. No wonder there are so many food options along the route – my hunger never wavered. It’s a treat for how much work these small towns put into entertaining the masses, but also a curse. There are almost too many things going on, you could easily roll into that day’s overnight town at midnight without even trying. But that’s what makes RAGBRAI so captivating and unique. Iowa’s residents pull out all the stops, as you saw in Jefferson and from the surrounding communities. In the end, I made it to Davenport without a single flat, injury or significant battle with self-doubt as my appreciation for Iowa expanded. After the exhausting first day, I settled in and enjoyed the ride. I know I’ll definitely be back next year, there are more people to meet, activities to try and food to consume. Perhaps I’ll tag along for the entire seven days. Until then, keep on pedaling, ya goons.